elcome to Bucks County Seafood! We pride ourselves on serving the freshest and finest seafood you'll find in the Central Bucks area. We are locally owned and operated and offer a selection that will make any seafood lover a happy camper! Our business has grown because we love customers who love seafood. We go out of our way to make you feel welcome and more importantly we provide products that will bring you back for more. And that's what it's all about, customer satisfaction. If you're happy then all is well with us. 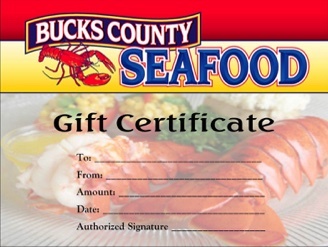 Stop in and see why folks are chowin' down on the freshest seafood around at Bucks County Seafood. We don't share our list & you can opt-out anytime. Ask about our Lobster Roll. News Flash: 1st of the Season Live Crawfish, Louisiana Crabs & Soft Shell Crabs! CALL AHEAD PLEASE!